Which Court Do I Need to Go to? If you decide to begin a court action, you need to find out which court is appropriate. There are both federal and provincial courts. Each province has its own court system. 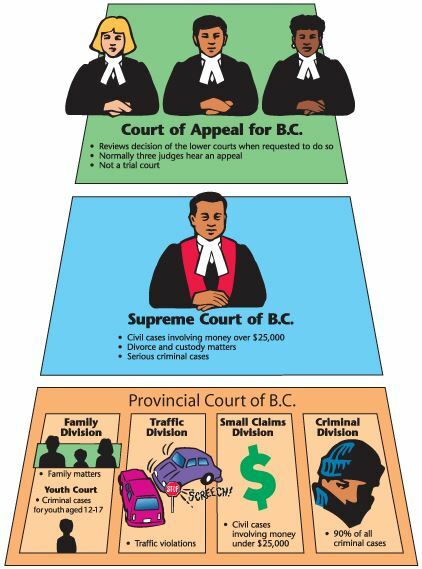 In BC we have the Provincial Court, the Supreme Court, and the Court of Appeal, as illustrated by the chart below. Note: On June 1, 2017, the limit for small claims increased to $35,000 from $25,000. The Provincial Court and the Supreme Court of BC handle general civil and family law matters, as well as criminal matters. The BC Court of Appeal is the highest court in the province and hears appeals from the lower courts. An appeal is when judges review the decision of a case from the court a level below. Decisions of the Court of Appeal may be appealed to the Supreme Court of Canada. The Provincial Court of BC can be easier for people to use without a lawyer. The process is generally simpler and faster than the Supreme Court of BC, and there are fewer fees. Family: Provincial Court hears only certain types of family disputes, such as guardianship, parenting time, and child and spousal support. In general, any matters not dealing with property or getting a divorce can be heard by the Provincial Court. Civil: The Provincial Court that deals with civil matters is referred to as Small Claims Court. Small Claims Court is for most disputes about debts or damages involving between $5,001 and $35,000 (with some exceptions). The Civil Resolution Tribunal accepts small claims disputes up to $5,000. The court process for the Supreme Court of BC is more complicated than Provincial Court and often takes longer. Family: The Supreme Court of BC can hear all types of family disputes. Civil: The Supreme Court of BC is for disputes over $35,000, with some exceptions. The Supreme Court of BC also hears appeals from the Provincial Court. An appeal is when someone applies to a higher court level to review a decision made in a lower court level. The Supreme Court of Canada hears decisions that have been appealed by provincial appeal courts. The BC Court of Appeal is the highest court in the province. It hears appeals of civil and criminal cases from the BC Supreme Court, as well as appeals of some criminal cases from Provincial Court. The Court of Appeal hears cases in Vancouver, Victoria, Kamloops, and Kelowna. Court registries are where you go to file documents, access court file information, and get information on court processes, including how to order court transcripts. Court Services Online is BC’s electronic court registry. You can use this website to search civil and criminal court documents, and to e-file your documents. The site has a filing assistant program that allows you to fill out forms, and view daily court lists. You can also view a tutorial showing an example search for a document as well as a page on search tips. Our Court System and Solving Disputes Dial-A-Law script. The handouts Provincial Court Resources for Everyone provide a selection of helpful info on Family Court, Small Claims Court, and Criminal Court. They are available in PDF format that you could download and also print. How do I know which court to go to for a family matter? Clicklaw common question. What’s the difference between Small Claims Court and the Supreme Court of BC? Clicklaw common question. Small Claims BC - Online Help Guide provides videos and information on small claims. Supreme Court of BC - Online Help Guide provides videos, guidebooks, court tips, and other information on civil matters, family law cases, and criminal law cases. Court of Appeal BC - Online Help Guide provides civil and criminal guidebooks, as well as definitions. The federal level of courts includes the Federal Court of Canada and the Supreme Court of Canada. The Federal Court of Canada includes Federal Court, and the Federal Court of Appeal. The Federal Court holds trials for cases on federal laws, mainly in the areas of immigration, income tax, and maritime law. The Federal Court of Appeal hears appeals of decisions by the Federal Court. Based in Ottawa, the Supreme Court of Canada hears appeals from decisions of the BC Court of Appeal, from the appeal courts of other provinces, and from the Federal Court of Appeal. This information applies to British Columbia, Canada. Last reviewed for legal accuracy by Courthouse Libraries BC staff, August 2018. This page was last edited on 10 August 2018, at 11:30.